Manufacturer of a wide range of products which include chitin. 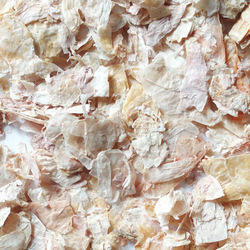 Chitin is the second most abundant natural biopolymer in the world, behind only cellulose. It is also the most abundant naturally occurring polysaccharide that contains amino sugars. This abundance, combined with the specific chemistry of chitin and its derivative Chitosan, make for the array of potential applications. Chitin, a long-chain polymer of N-acetylglucosamine, is a derivative of glucose. It is a primary component of cell walls in fungi, the exoskeletons of arthropods, such as crustaceans (e.g., crabs, lobsters and shrimps) and insects, the radulae of molluscs, cephalopod beaks, and the scales of fish and lissamphibians. The structure of chitin is comparable to another polysaccharide - cellulose, forming crystalline nanofibrils or whiskers. Chitosan is a fine off white, odorless Powder extracted from Crab and Shrimp Shells and its derivatives. It has a wide array of commercial and biomedical uses. It can be used in agriculture as a seed treatment and biopesticide, helping plants to fight off fungal infections. In winemaking, it can be used as a fining agent, also helping to prevent spoilage. In industry, it can be used in a self-healing polyurethane paint coating. In medicine, it is useful in bandages to reduce bleeding and as an antibacterial agent. Itis also used to help deliver drugs through the skin. We supply Chitosan at varied deacetylation values (80 – 95%) and mesh sizes (35 to 100). We also supply High Bulk Density Chitosan (HBDC) ideally suitable for encapsulation, having a bulk density of 0.8gm/ml and 0 mesh size to 100 Mesh. Chitin & Chitosan have a wide variety of uses in health care. Most important are Wound Care, Implants fat & cholesterol –binding drugs, and drug delivery. In terms of function, it may be compared to the protein keratin. Chitin has proved useful for several medicinal, industrial and biotechnological purposes. Fat Absorbent: The ability of the Chitosan molecule to scavenge fat and cholesterol in the digestive system, plucking it from the stomach and excreting it in the duodenum, has significant implications for its use as a beneficial food additive. Food containing Chitosan or Chitosan complexed with a fatty acid, could be designed to reduce obesity, cholesterol levels and the incidence of colon cancer. Wound Healing Ointment: An obvious method of exploiting Chitin’s wound-healing properties is to use the material in ointments for treating wounds. Wound Dressing: Several research groups and companies, notably in Japan, have devised methods of making wound dressings from Chitin or Chitosan. This type of dressing is used for burns, surface wounds and skin-graft donor sites. Surgical Sutures: These work by remaining in tissue long enough to permit healing to occur and then slowly dissolving; therefore, they need not be removed. Unlike several other suture materials that are absorbed by the body, these do not cause allergic reactions. Opthalmology: Both contact lenses and the intraocular lenses used in cataract surgery must have one significant characteristic gas permeability. Chitin and Chitosan can make lenses more permeable to oxygen than other lens materials. This could be particularly useful for injured eyes, because Chitin & Chitosan also help to heal the wounds. In addition, Chitin does not adhere to eye wounds; that makes removing the lenses from the eyes safer. Hard contact lenses can also be prepared using Chitin n-butyrate. Dental: Since, Chitin can regenerate the connective tissue that covers the teeth near the gums, it has possibilities for treating periodontal diseases such as gingivitis and periodontis.